there was no wii zumba for me last night. i started to get a headache before i left the office last night. by the time dinner dishes were cleaned up and lunch/snacks were packed…it took everything i had not to cry from the pain. i haven’t had a headache like that – of that magnitude – in a very long time. i think it was a combination of the weather and my body going through some sort of carb withdrawal and detoxing. either way it just sucked. not only that – my poor old bones. you know you are old when you can tell what the weather is going to be like based on how your bones feel. not sure if i have ever mentioned this here before, but i have been a victim of a hit and run twice in my life. so for the past couple of days my knee and my ankle have been really sore. i woke up this morning and my other ankle was sore. wtf???? what could i have possibly done in my sleep? because man this is making me feel OLD. other than that…i am wonderful today lol…just falling apart! today i had the “bee special” for lunch. haven’t had that in forever. 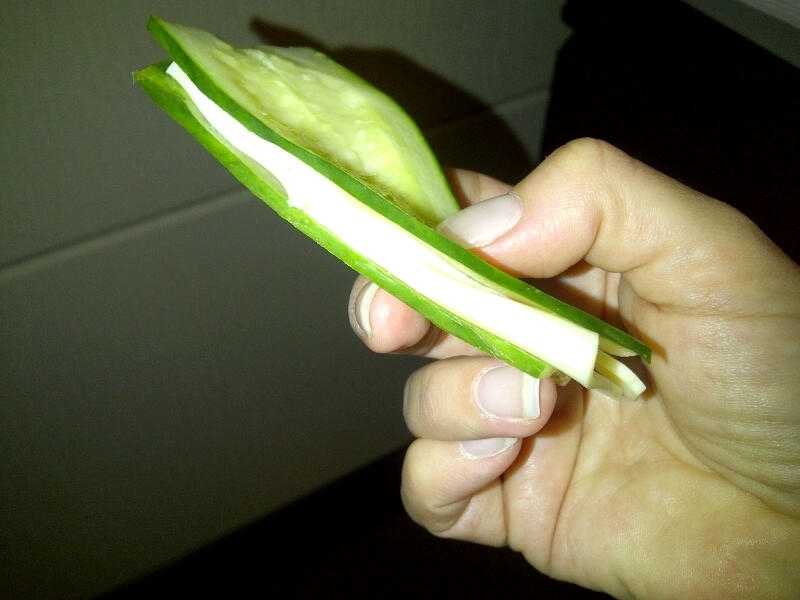 i rediscovered how very much i love my cucumber sandwiches. mmmm mmm good. This entry was posted in life and tagged blogging, diet, health, humour, life, old, personal, random, weight loss, wii, zumba on May 2, 2012 by losing bee. Awe. I’ve felt the “getting old” aches. It’s crazy. I swear, one day a while ago I woke up and realized I was getting old. It just hit me like a ton of bricks. thanks Scott 🙂 today wasn’t all that bad…but yes, here’s to a better day tomorrow! how funny, i was JUST thinking of you yesterday!!! my wine is still sitting there staring at me. i will have a glass in a week. but i’d be lying if i said i didn’t want a glass right now! well I’m pretty much back to where I started from! Just in time for summer and bathing suits too. Oh well, at least I keep trying. Not so hot. after 2 weeks of low carb and zero booze the scale didn’t move. So, I’m back to oatmeal, salads and trying to eat right – which is cheaper.